In this age of innovation in the area of digital musical instruments, ever-increasing numbers of interested musicians and programmers are experimenting with the development of new and exciting pieces of hardware and software that are redefining what we think of as instruments. The creation of applications that act as instruments, or fulfill other custom audio synthesis and processing needs, has become accessible to even the most novice of computer users, thanks to visual programming environments like Max and Pure Data that are designed primarily for audio purposes. libmapper is a software library for connecting virtual data signals locally or across networked computers running, providing tools for creating and using systems for interactive control of media synthesis, and is able to integrate effectively with programs like Max and Pure Data. In this tutorial, I will demonstrate how to transmit numerical data from one Max project to another Max project using the libmapper library and its associated tools. libmapper is an open-source software with cross-compatibility among many software environments. The developers have already created the two tools needed to use libmapper with Max: external objects for Max, and a graphical user interface (mapperGUI) to perform mapping operations among the objects. The software can be downloaded at http://idmil.org/software/libmapper/downloads, where installation instructions can also be found. libmapper can be used only to transmit integers and floating-point numbers. 1. Create/open the two Max patches between which you intend to transmit information. These can both be running on the same computer, or can be running on separate computers, each running Max, as long as they are connected via a Local Area Network connection (typically Ethernet or Wi-Fi). 2. Go to the patch that contains source data. This could include any data-rate (not audio-signal-rate) generator, such as the output of a slider or number box. 3. Create a new object box, and type map.device [patchname], where [patchname] is the name you wish to give to that specific patch on the network. You must not use any spaces in your naming scheme in libmapper, as this will cause errors and much frustration. For our purposes, let’s call this device “signal_source”, meaning we’d create an object box and type map.device signal_source. 4. Create a new object box, and type map.out [sourcename] [i/f], where [sourcename] is the name of this source, and i or f sets whether it will be sending integers or floating-point numbers, respectively. Optionally, you can add the arguments @min [minvalue], @max [maxvalue], and @unit [unit], the first two of which define the range of the values received by the map.out box, and the last of which labels the data’s measurement unit for convenience later on (Hz, for example). Defining the range of values allows you to use libmapper’s powerful scaling features after you complete your patching. In this example, we’ll make a box containing map.out “pitch_raw” i @min 0 @max 1023 @unit pressure. 5. Go to the patch where you wish to send the data. 6. Create a new object box with the map.device object (see step 3), with your desired name. 7. Create a new object box, and type map.in [destinationname] [i/f], with a similar manner to step 4. Fill in the arguments for scaling, if you will use this feature, as well as the @unit argument for convenience, if appropriate. For our box, we will use map.in frequency f @min 440 @max 880 @unit Hz. 1. 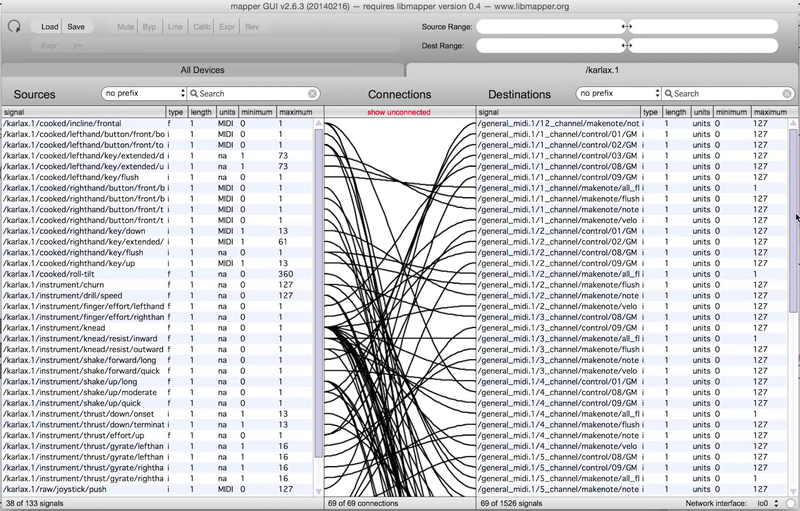 Launch mapperGUI, an application for configuring libmapper data mappings. Although libmapper is cross-platform, and Max externals are compiled for Mac OS X and Windows, mapperGUI and other libmapper GUIs are only made for Mac. However, these GUIs can perform mappings for libmapper instances running on PCs and Macs if they are connected on the same local area network. 2. Once the application has opened, observe the three main columns in the window, Sources, Links, and Destinations. In the Sources column, you should see an entry called “/signal_source.1” or whatever you named your source patch with the map.device object. This will provide information including the number of inputs(map.in)/output(map.out) contained within the patch, the port on which the patch communicates, and the IP address of the machine on the network. In the Destinations column, you should see an entry called “/destination.1” or whatever you named your destination patch with the map.device object. The Links column should be empty. 3. First, we must tell libmapper that you wish to route data from your source patch to your destination patch. To do this, click and hold on top of the entry for “/signal_source.1” in the Sources column, drag across the Links column, and release the mouse button on top of the entry for “/destination.1” in the Destinations column. A line will appear linking the two entries. If you wish to have one source patch transmit to more than one destination patch, create multiple “Links” from that source by clicking and dragging to each one. 4. Next, click on the tab for your source device that is listed above the three columns, next to “All Devices.” Ours will be called “/signal_source.1”. 5. You will see three columns as before, but this time, Sources will show your map.out object name(s) within your source patch, Destinations will show your map.in object name(s) for all available destinations to which you have linked, and the “Links” column is replaced by “Connections”. 6. To connect a source to a destination, drag from the source, across the Connections column, to the destination, similar to step 3. As with step 3, you can connect one source to more than one input. 7. That’s it! Any data sent into the inlet on your map.out object will be sent to any map.in objects to which you have connected it. map.in objects will receive the number in whichever format is specified in their name, regardless of the originating type of data, meaning floating-point boxes will output all numbers received as floating-point numbers, regardless of how the data was sent, and integer boxes will output all numbers received as integers (floating-point numbers received by integer boxes will be rounded down to the nearest whole number). By default, if the @min and @max values have been specified in the Max objects, libmapper will scale the numbers streamed from object to object using these parameters in a linear fashion. In our case, the “pitch_raw” source’s range of 0-1023 will be mapped only the “frequency” destination’s range of 440-880. 1. To set connection preferences in mapperGUI, click on a connection from a source map.out object to a destination map.in object. The line and objects will become highlighted. 2. At the top of the mapperGUI window, just under the title bar, there will be a group of boxes: Mute, Byp, Line, Calib, Expr, and Rev. • “Mute” temporarily disables all throughput on a connection without permanently removing it. • “Byp” disables scaling, and all number will be unaltered from source to destination. • “Line” is the default option, and scales numbers linearly based on source and destination ranges. • “Calib” lets you calibrate the input range based on real-time input data and the preset output range. • “Expr” lets you transform source numbers using a mathematical expression. • “Rev” is a feature that lets you reverse the functionality of a set of map.out and map.in boxes, with all scaling bypassed. 3. Finally, connections and settings within the Sources-Connections-Destinations can be saved and recalled by using the Load and Save buttons in the top-left corner. Although not a complete guide to using libmapper with Max and mapperGUI, this should serve as a functional introduction to allow for quick patching and experimentation in the development and use of digital musical instruments and other media projects. In this tutorial, I will explain how to create a reversed reverberating effect in 5 steps on any source using any DAW and any reverb plugin. Reversed reverb is a fairly common effect, but this has been of particular interest to me as it is an effect that can not exist in natural conditions. This is due to the fact that all audio processing occurs after the source has been played or captured. For example, traditional reverberation is the delay and diffusion of a signal after it has been generated. With the case of a reversed reverb, the processed sound (the diffused “wet” signal) is heard before one hears the direct source (the “dry” signal). This makes it impossible of an effect to use live, as either the reverb algorithm would need to know what’s going to be played before the performer even plays anything, or the signal would need to be delayed an amount of time at least equivalent to the reverb’s decay time. This is what causes the effect to sound particularly ethereal, as it transcends the linearity of time itself, and implies that the source exists outside of the constraints of time. Of course, the nature of digitalized audio removes these physical limitations and allows us to create such an effect. 1. The first step of this process is to ensure that whatever source one wishes to process is an audio file. This technique will not work with MIDI tracks, so if the source is a software synthesizer or sampler, one will need to bounce the track to an audio file. 2. The next step is to reverse the source that one wishes to process. This is why step one is necessary, as one can only reverse audio files. 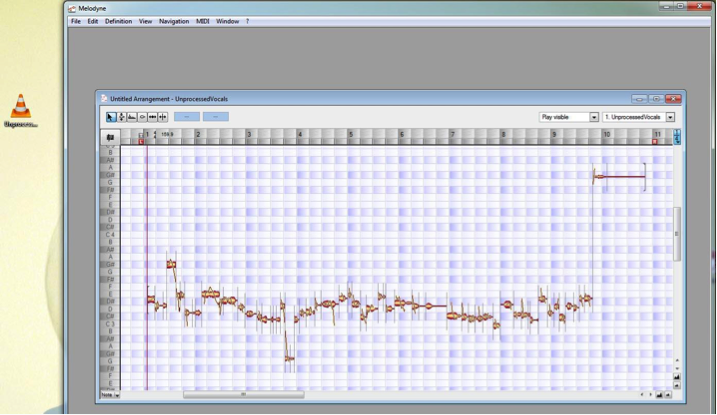 Nearly all DAWs have an easily accessible function for this. 3. Once one has a reversed source, apply a reverb to the reversed track. The parameters of the reverb can be adjusted to taste, but the reverb needs to be set to “100% wet” so that one can only hear the reverberated sound and none of the original reversed source. 4. 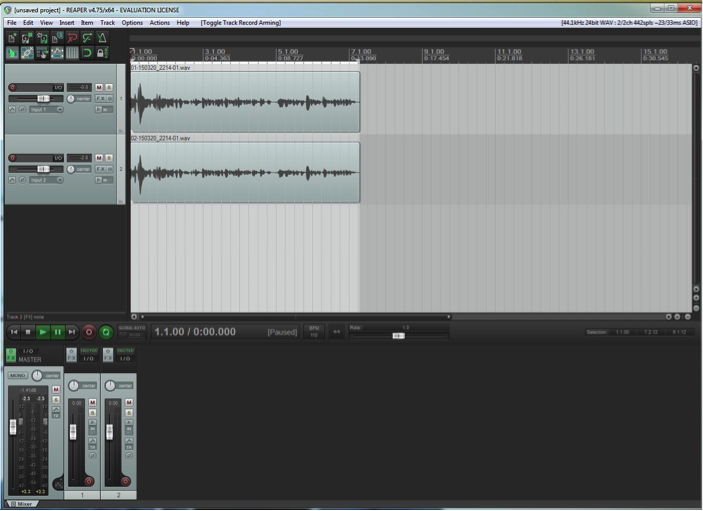 Next, bounce the reverberated reversed source to a new audio track. Once this is done, you can remove or bypass the reverb on the original reversed source, so that one is left with a dry source and a wet source. 5. 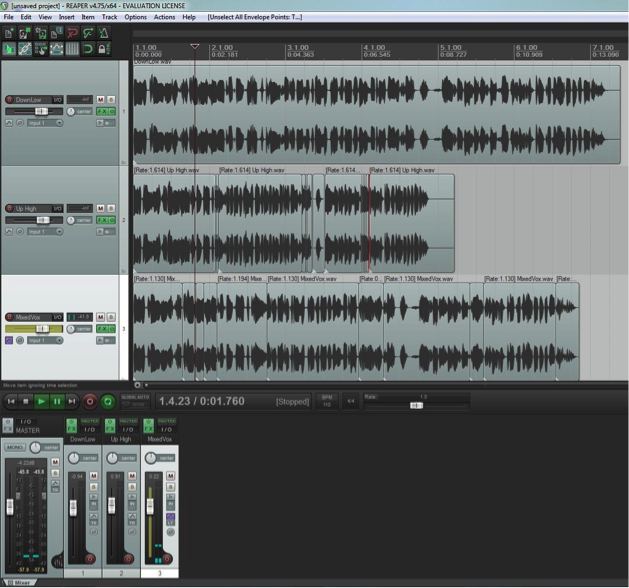 Once this is complete, reverse the audio files for both the dry and the wet tracks. This will cause the dry source to return to it’s normal un-reversed state, and will cause the wet track to reverberate before the the dry source plays. Depending on the bounds of the audio files, it is likely that you will have to experiment with the timing of the wet track relative to the dry track in order for them to overlap properly. Simply drag the wet track left or right until you feel that the two tracks have merged into a single sound. I hope this tutorial has been an informative inspirational launching pad for even greater ideas. I highly recommend experimenting with layering several different reverb algorithms together (one short, one longer for example), or processing the wet track even further by applying effects such as a chorus or a phaser on it. As music students, enthusiasts, composers, recorders, and players, we are always looking for ways to improve our craft, whether it be with new technology, techniques, or software. One aspect for musicians is writing our own music. Notating it can be as simple as taking a piece of score paper and writing notes on it, much like it has been done millions of times before. But this technique requires someone to have an internal working on how the notes sound and how the intervals sound, and for some people that can be very difficult. This is where music notating software comes into play. 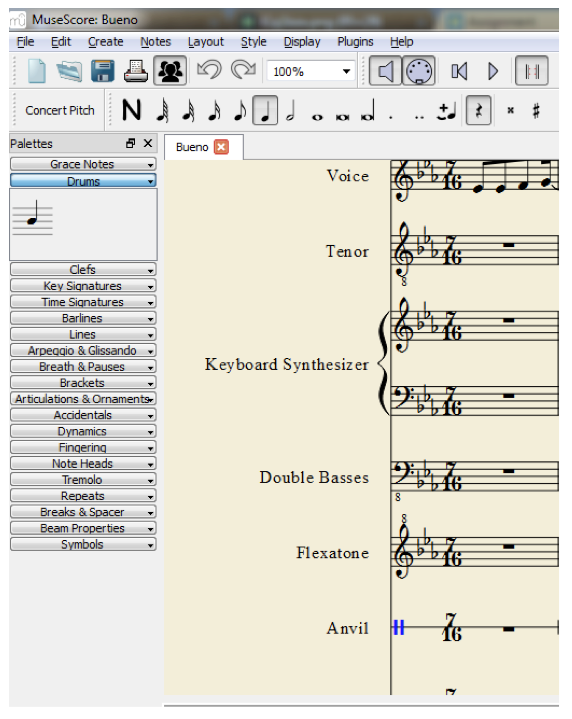 One of the leaders in music notating software is Finale. Most musicians have probably looked at and used Finale at some point in their career. However, Finale is very pricy, with the 2014 version being upwards to $600, and it can have a very steep learning curve (this is coming from personal experience). With this being said though, there are alternatives. And they are free. 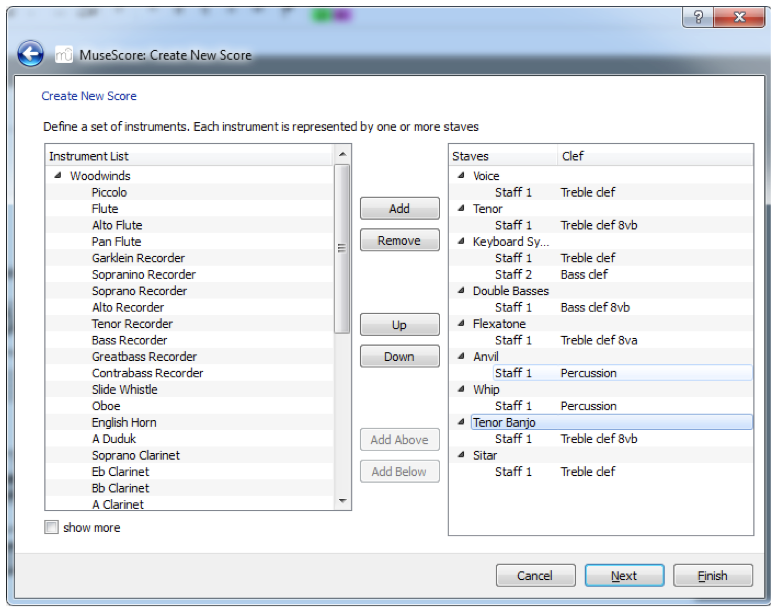 Introducing MuseScore; a free, open source music composition and notation software created by Werner Schweer. For musicians (and especially students), purchasing programs such as Finale can seem impossible, due to the high price, but MuseScore provides an excellent alternative. of what MuseScore is capable of. 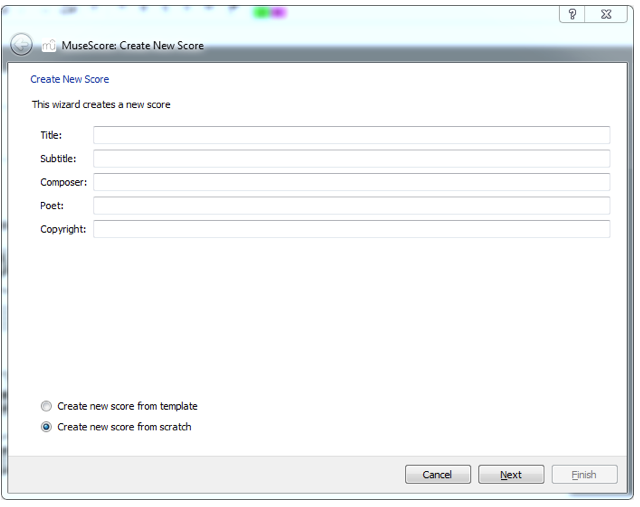 Upon first listening to the sample by pressing the space bar, the score included a blue bar following the where the program was in the score, making following along easier. However, the MIDI sample of the piano was certainly not the best (although after exploring some other instruments, some MIDI samples are better than others). However, keeping in mind that this is a free program, it’s not something to complain about; the program still conveys its message very well. Starting up a new score is very easy. It’s as simple as clicking on File > New. After this, I was prompted with a window to name the composition and add any amount of information I desired. After typing in the information and clicking next, the window brought me to a menu where I could add just about any amount of instruments I wanted, which included everything found in a typical orchestra plus many more. After clicking Next, the window brought me to a menu where I could select a key signature for the piece, and then finally to a menu where I could choose the tempo, number of bars, and time signature for the piece. After clicking finish, the score was ready. Inputting notes is very simple. By simply pressing the N key on the keyboard, you enter a note entry mode. And from there, just select the value of the note you want (whole, half, quarter, etc.) from the menu at the top and click anywhere on the staff you would like the note to go. It’s that simple. The only problem I encountered was inputting percussion parts, which are entered in a slightly different way. All it takes is to click the percussion staff, click on drums under palettes on the left side of the screen, click on the note that appears under drums, and start clicking on the percussion staff. Using and learning MuseScore was certainly the easiest experience I have had thus far with a music notation program. Although it does not include some features Finale has and some of the MIDI samples are better in Finale, having a free program that does just about everything Finale does is hard to argue with. This video was created by Robin Stubbs as a course assignment for “Integra Contemporary and Electroacoustics Ensemble” at The University of Lethbridge (Canada).